1) The paper was presented and awarded "Best Paper" at the 5th International FIG Workshop on 3D Cadastres. The aim of this paper is to probe the ways the legislation can be included into a Marine Administration System (MAS) and to present how Rights, Restrictions and Responsibilities (RRRs) relating to marine space may be defined and organized. The interests, responsibilities and opportunities of states to provide infrastructure and resource management are not limited to their land territory but extend to marine areas as well. So far, although the theoretical structure of a Marine Administration System (MAS) is based on the management needs of the various countries, the marine terms have not been clearly defined. In order to define a MAS that meets the spatial marine requirements, the specific characteristics of the marine environment have to be identified and integrated in a management system. To explicitly define MAS, certain issues need to be addressed such as: the types of interests that exist in marine environment, the best way to capture and register those interests, laws defining these interests, and their hierarchical classification, as well as how this classification can be used to produce the principles for the implementation of MSP. In addition, the registration of laws in a MAS that could automatically define the constraints of the emerging Rights, Restrictions and Responsibilities (RRRs) should be addressed, along with property/ tenure object definition. Further questions need to be answered e.g., what is the basic reference unit and how can this be defined, deliminated and demarcated, capturing the 3D presence of marine parcel and is the traditional definition of a cadastral parcel applicable in a marine zone defined by United Nations Convention on Law of the Sea (Hereinafter: UNCLOS) (United Nations, 1982) and how could the fourth dimensional nature of marine RRRs be included. Addressing these questions constitutes the basis upon which a MAS can be built. However, the most crucial question is how the international standards and practices of land administration domain can be used for managing the marine environment. The aim of this paper is to examine the above questions, to probe the ways the legislation can be included into a MAS and to present how RRRs relating to marine space may be defined and organized, in order to develop a MAS based on international standards by means of not only trading in marine interests, but rather facilitating the management of activities related to resources. Over the last two decades, countries with extensive coastlines and confined marine space, where they exercise sovereignty and powers, have dealt with the concept of MAS. Among others Australia, Canada, the Netherlands and the United States have developed systems for the administration of marine interests and the sustainable management of marine resources (Athanasiou et al, 2015). Their efforts are at a development stage, based on practices adopted in the fields of Marine Cadastre (MC), Marine Spatial Data Infrastructure (MSDI), Marine Spatial Planning (MSP). Many definitions have been given to MC, as Nichols et al (2006) extensively described. It can be broadly defined as “an information system that records, manages and visualizes the interests and the spatial (boundaries) and non-spatial data (descriptive information about laws, stakeholders, natural resources) related to them”. MSDI is fundamental to the way marine information is developed and share for competent marine administration. MSP is a planning frame for balancing the rival human activities and managing their effects in the marine environment. The LADM, since it consists the first standard and approved base model for the land administration domain (ISO 19152, 2012), establishing a rigorous mechanism for managing legal RRRs, their spatial dimension and the stakeholders. The implementation of this standard to the marine domain seems feasible since the triplet Object – Right – Subject, which consists the basis of LADM, applies as well in the marine environment. The S-100 Universal Hydrographic Data Model, which provides the framework and the appropriate tools to develop and maintain hydrographic related data, products and registers. Following the proposal made by Geoscience Australia in 2013 for the development of a product specification for Maritime Limits and Boundaries, Canadian Hydrographic Service & Geoscience Australia presented a model in relation to LADM and marine environment. The report proposes the extension of S-100 to support LADM, through the development of the S-121 Maritime Limits and Boundaries (Canadian Hydrographic Service & Geoscience Australia, 2016). In order to develop and implement the aforementioned models into the marine environment, the unique features of the marine space must be taken into account. This paper explores the range of laws that dictate marine interests, identifies the marine legal object and provides the legislative framework and the RRRs that relate to marine space, in order to be optimally organized towards the development of a MAS based on international standards. Standards are widely used, since they provide efficiency and support in communication between organizations and countries as well as for system development and data exchange based on common terminology. Domain specific standardization is needed to capture the semantics of marine administration. Such a standard will support marine registry and cadastral organizations utilizing a Geographic Information System along with a Data Base Management System and applications, in order to implement and support marine policy measures. Current discussions and efforts focus on the development and implementation of marine data modeling taking into account practices from Land Administration Standardization. Therefore, the registration of interests encountered in the marine environment with their spatial dimension may be modeled in accordance with terrestrial mapping methods and standardization techniques (Canadian Hydrographic Service & Geoscience Australia, 2016). The basis of the model will be the S-100 – IHO Hydrographic Geospatial Standard for Marine Data and Information. The LADM, was approved on the 1st of November 2012 as an international standard, ISO 19152, constituting the first adopted international standard in the land administration domain. LADM provides a formal language for the description of existing systems, based on their similarities and differences. It is a descriptive standard, not a prescriptive one that can be expanded. LADM is organized into three packages and a subpackage (Lemmen, 2012). These are groups of classes with a certain level of cohesion. The three packages are: Party Package; Administrative Package; Spatial Unit Package and subpackage: Surveying and Spatial Representation Subpackage. The model contains thematic and spatial attributes. Furthermore in several attributes code lists are used rather than character strings in order to ensure consistency. The modification and adoption of code lists in national profiles is possible. From the 3D perspective, LADM supports both 2D (LA_BoundaryFaceString) and 3D objects (LA_BoundaryFace) and distinguishes legal and physical objects by introducing external classes for BuildingUnit and UtilityNetwork. It covers the legal space while the physical counterparts are not directly generated in LADM. At the semantic level, legal entities are not enriched by classifying data in relation to each other (Aien et al, 2013). Furthermore, LADM through the VersionedObject class provides the attributes beginLifespanVersion and endLifespanVersion, allowing the recreation of a dataset at a previous point in time leading to a 4D visualization of the Cadastre (Griffith-Charles and Sutherland, 2014). The implementation of the model in marine environment is a user requirements in LADM version A. Furthermore the scope of the standard explicitly addresses the water when referring to land. Lemmen (2012) states “With some imagination the laws (formal or informal) can be seen as ‘parties’; in fact the laws allow people to have interests in ‘marine objects’. The interests are RRRs”. The common denominator or the pattern that can be observed in land administration systems as it is derived from the LADM is with a package of party/person/organisation data and RRR/legal/administrative data, spatial unit (parcel) data. The same pattern is also applicable on marine space. S-100 provides a contemporary hydrographic geospatial data standard that can support a wide variety of hydrographic-related digital data sources. It is fully aligned with mainstream international geospatial standards, in particular the ISO 19100 series of geographic standards, thereby enabling the easier integration of hydrographic data and applications into geospatial solutions. The primary goal for S-100 is to support a greater variety of hydrographic-related digital data sources, products, and customers. This includes the use of imagery and gridded data, enhanced metadata specifications, unlimited encoding formats and a more flexible maintenance regime. This enables the development of new applications that go beyond the scope of traditional hydrography - for example, high-density bathymetry, seafloor classification, marine GIS, et cetera. S-100 is designed to be extensible and future requirements such as 3-D, time-varying data (x, y, z, and time) and Web-based services for 85 Katerina Athanasiou, Efi Dimopoulou, Christos Kastrisios and Lysandros Tsoulos Management of Marine Rights, Restrictions and Responsibilities according to International Standards 5th International FIG 3D Cadastre Workshop 18-20 October 2016, Athens, Greece acquiring, processing, analysing, accessing, and presenting hydrographic data can be easily added when required (IHO,2015). Following the adoption of S-100, many product specifications are under development by the IHO S-100 specialized Working Groups (WGs) including S-101 for Electronic Navigational Charts (ENCs) and S-121 for Maritime Limits and Boundaries. The proposed S-121 is built upon the ISO 19152, which provides a rigorous mechanism for handling legal RRRs. The intended purpose of S-121 is “to provide a suitable format for the exchange of digital vector data pertaining to maritime boundaries” and “for lodging digital maritime boundary information with the United Nations for purposes related to UNCLOS” (McGregor, 2013) What is more, as all ISO 19000 series product specifications, S-100 and the subordinate S-121 are intended to interwork with all similar products. In that sense, S-121 may serve as the bridge between the land and marine domains while the Maritime Limits and Boundaries following the S-121 standard may be used in a MAS. In S-121 each real world feature is an object with properties represented as attributes (spatial and thematic) and associations which establish context for the feature. The spatial attributes of the feature describe its geometric representation, whereas the thematic attributes describe its nature. The attributes associated with the geographic feature depend on the intrinsic type of the feature, a concept derived from LADM which is not included in the S-100 suite. A feature object may only have one intrinsic type that is the physical dimension of the feature in the real world based on the “Truth on the ground” principle. Hence a feature may either be a point (Location), curve (Limit), area (Zone) or volume (Space). Subsequently, the feature is described in the dataset by the geometry property (point, line, area) which is used for its cartographic representation. Finally, for the portrayal of each geometry property, which is separate from geometric representation, a variety of symbols may be used. For instance, the intrinsic type of a football field is Zone. Depending on the scale of the cartographic product, the geometry of the field may be area (large scale maps) or point (small scale maps). Finally, for the portrayal of e.g. the point geometry, can be used a simple point, a star or a variety of other symbols. The proposed S-121 is a product based on S-100 which has many similarities to the LADM, as it imports from LADM primitives not supported by S-100, but differences as well. In example, GM_Curve and GM_Surface from the ISO 19152 class LA_SpatialUnit are useful for a MLB standard and therefore have been imported to the S-121. A fundamental difference between the LADM and the S-121 is the use of the Multi-primitive MultiSurface features in the land environment, whereas in the marine environment it is a requirement from S-100 to use complex features instead. In detail, when an object is crossed by another, in land the crossed feature is defined as a multi-surface, whereas in the marine environment each spatial primitive is a simple rather than a complex one. Another issue is the use of 3D objects which LADM addresses with the LA_BoundaryFace and LA_BoundaryString, whereas, due to the limitations of S-100 which does not address 3D objects, S-121 handles 3D objects as 2D objects with vertical extent (2.5 dimensions) (Canadian Hydrographic Service & Geoscience Australia, 2016). For cross-border access of geo-data, a European metadata profile based on ISO standards is under development using rules of the implementation defined by the Infrastructure for Spatial Information in the European Community – INSPIRE (ISO 19152, 2012). INSPIRE (Directive 2007/2/EC) focuses strongly on environmental issues, while the LADM has a multipurpose character. One important difference is that INSPIRE does not include RRRs in the definition of cadastral parcels. LA_SpatialUnitGroup as basis for CadastralZoning. Regarding the marine space, the expression and the definition of the above classes needs to be examined. INSPIRE data specifications are being developed across 34 themes. A number of INSPIRE themes have a marine relevance, something that researchers have already pointed out (e.g. Longhorn, 2012). Two of the themes, i.e. Ocean Geographic Features (OF) and Sea Regions (SR) are related exclusively to marine environment. According to Millard (2007), ”INSPIRE is not marine nor land centric”. Themes are considered independent of whether or not refer on land or at sea, and therefore data can be brought together across land-sea boundaries. INSPIRE provides a level of interoperability to deliver integrated land-sea datasets. But the data models (by design) will not solve the needs of all communities e.g. navigation. The marine themes on their own do not give all the information on the marine environment. According to Lemmen (2012) “firstly, it is possible that a European country may be compliant both with INSPIRE and with LADM and secondly, it is made possible through the use of LADM to extend INSPIRE specifications in future, if there are requirements and consensus to do so”. Given that IHO S-121 ”Product Specification for Maritime Limits and Boundaries” is based on LADM, it is inferred that INSPIRE can cooperate as well with S-121 mainly in the spatial dimension. When considering the legal framework for the marine environment, certain factors must be taken into account: the laws that define the interests, the hierarchical classification of these laws considered as reasonable (Cockburn and Nichols, 2002), how should this classification be used to derive the principles for the implementation of MSP and how the registration of laws in a MAS can automatically define the constraints of the emerging RRRs. Given the particular nature of the legal system of the marine space and the necessity of an organized setting for its use, based on already predetermined planning, the rights that may appear are defined in a unique way by the law. Unlike land, maritime space does not allow the rights’ creation as a private enterprise product and seeks for a regulation with a direct correlation to the creation of the right and the need to impose its creation. The term "law" refers to the wider legislative framework which is the basis of MAS. Laws and regulations create or describe rights and then provide the means to implement or enforce them. Thus, in order to develop a MAS, the registration of laws is considered reasonable. This section presents both the institutional framework that defines the legal status of the marine space and the legal framework that defines the application of these laws. The international law defines the kinds of RRRs that may exist within the marine space, which falls under the sovereignty of a state. A considerable part of international law is consent-based governance. This means that, with the exception of those parts that constitute customary law, a state is not obliged to abide by this type of international law, unless it has expressly consented to a particular course of conduct. This is an issue of state sovereignty. Treaties may require national law to conform to respective parts and they are commonly transposed into national legislation by typical law. The European Union Law (mainly the EU Directives) aims to establish a common framework and a common approach for the development of an Integrated Maritime Policy. Memberstates should implement the EU Directives transposing them into national law. The choice of appropriate form and method to implement relies at their discretion (Article 288, Treaty of Functioning of the European Union). For example in Greece, an EU Directive is commonly incorporated into the national legislation by a typical law. Although domestic law is playing an important role in regulating the management of the sovereign areas of a State, in the marine environment international law has been the primary basis for the implementation of maritime policies and boundaries. Historically, the world’s oceans operate under the principle of freedom of the seas. The multitude of claims, counterclaims, sovereignty disputes between the States with coastlines, the rapid improvement in technology and the increasing interest in exploring the marine environment has caused the need for an effective international regime governing the world’s oceans. The most intensive efforts have taken place at the 20th century. In 1982 the UN concluded to the UNCLOS, which forms the cornerstone of the legal mechanism and describes the rights, obligations and types of interests of states. One of the ways established has been through the division of marine space into different zones where the coastal states enjoy sovereignty or sovereign rights and thus the jurisdiction to establish their laws and policies, in compliance with UNCLOS guidelines. The exercise of these rights is subject to a registration system of Management of the marine area. According to Cockburn et al (2003), UNCLOS influences a ratified nation’s MAS in several ways, like breadth, depth, what rights can be included in the ocean areas and hence what spatial information is contained therein and has an effect on the evidence that can be used for boundary delimitation. UNCLOS has created a complex three-dimensional mosaic of private and public rights (Ng’ang’a et al, 2004), which the party members have to incorporate into their national legislation, with the enactment of new and/or modernization of national laws and regulations. The Convention is the background of exercising any marine activity and therefore the reason to create a MAS, since it creates a sovereignty status on the marine space. Directive 2007/2/EC of 14 March 2007 establishing an infrastructure for spatial information in the European Community – INSPIRE directive. After that the INSPIRE Marine Pilot Project has been launched to help stakeholders of the Marine Strategy Framework Directive 2008/56/EC to understand how the obligations of the INSPIRE Directive 2007/2/EC relate to the data and information management aspects of the MSFD. The European Maritime Policy is still under development. The most recent activity on the MC in European Union is the agreement on the need for a common study on the importance of MC to the European economy. As a result of the structure of international law it is estimated that around 50% of the world’s oceans fall within the national jurisdiction of coastal states, whereas the remaining 50% represent part of the Area (Prescott and Schofield, 2005). Greece is a state virtually surrounded by sea located in the central part of the Mediterranean sea. In the western part of Greece lies the Ionian sea. The maritime front of this part of the mainland and of the nearby islands generate rights of continental shelf and EEZ (not yet declared) for Greece which overlap in with the corresponding rights of Italy, Albania and Libya. In the East, Greece shares maritime borders with Turkey and Cyprus. In the south of Crete lies the Libyan /South Kritiko sea, which covers the area bordering with the Cretan, the Libyan and the Egyptian coasts. Therefore the maritime neighbors of Greece are Albania, Italy, Libya, Egypt, Turkey and Cyprus. The breadth of Greece’s territorial sea was set at 6 nautical miles (NM) from the natural coastline in 1936 in the Mediterranean Sea basin (Law 230/1936 as amended by Presidential Decree 187/1973, which constitutes the Greek Code of Public Maritime Law). It has been declared that Greece reserves its right under international law to establish a 12 NC territorial sea at a time deemed appropriate. However, the limit of 10 NC in the national airspace was maintained explicitly based on previous legislation (Decree of 6 September 1931 in conjunction with Law 5017/1931). Regarding the Continental Shelf the distance between the Greek coasts and the coasts of her neighboring states are less than 400NM, and therefore Greece needs to agree its limits with the above states. So far, Greece has concluded agreements with Italy (1977) and Albania (2009) based on the median line principle. It is noted that Greece has not declared an EEZ. With respect to the legal framework for the management of the marine environment, national legislation and regulation inevitably reflect the specific interests, concerns and structures of the State. The manner in which international Treaty law becomes part of national domestic law (or is transformed into domestic law) is different for each State. Greece has ratified UNCLOS and has enacted a number of laws for the areas she exercises sovereign rights. What characterizes the Greek coastal and marine area is the non-unified national strategy and the attempt to resolve the issues presented by creating piecemeal provisions. There is no comprehensive strategy to deal with the fractured and incomplete sets of data that are the legacy of the complex administrative and legal structures. The introduction of the General Framework for Spatial Planning and Sustainable Development and the Special Framework for the coastal area and the islands are a great advantage for these problems to be solved. The creation of specific legislation on the shore and the foreshore is an important part of spatial, urban and environmental planning for the coastal area. Internal Waters (IW), which cover all water on the landward side of the baselines. The internal waters are considered part of the State’s territory and the coastal State exercises full sovereignty over them (UNCLOS, Article 8), similar to that on the land Sovereignty is applied over the air space, water column, seabed and subsoil, and postulates that foreign vessels and states are deprived of all of the high seas freedoms, with the exception of Article 8(2). Territorial Sea (TS), measured from the baseline seaward, the breadth of which may not exceed 12NM. The coastal State’s sovereignty is extended beyond its land territory and internal waters in the territorial sea (Article 2), also extending in the air space over the territorial sea as well as to its bed and subsoil. Sovereignty postulates that foreign vessels and states are deprived of all of the high seas freedoms, but within this zone foreign vessels enjoy the right of innocent passage (Article 19). Contiguous Zone (CZ), a zone adjacent to the territorial sea which may not extend beyond 24 NM from the baselines. In the contiguous zone the coastal State has the jurisdiction to regulate and put laws into in order to prevent and punish infringements of its customs, fiscal, immigration or sanitary laws committed within its land territory or territorial sea (Article 33). Moreover, in order to control traffic of archaeological and historical nature found at sea, the coastal State may, in applying the above relating to the contiguous zone, presume that their removal from the seabed in the zone referred to in that article without its approval would result in an infringement within its territory or territorial sea of the abovementioned laws and regulations. Within contiguous zone the coastal state has no further rights and the high seas freedoms remain unaffected for the other states. Exclusive Economic Zone (EEZ), which is adjacent to the territorial sea and may not extend beyond 200 NM from the baseline. In the Exclusive Economic Zone the coastal state has exclusive sovereign rights for the purpose of exploring and exploiting, conserving and managing the natural resources, both living or non-living and the jurisdiction to establish artificial islands or installations and to conduct scientific research. Coastal state is responsible for the protection of marine environment. Foreign vessels enjoy three of the six high seas freedoms, namely the freedoms of navigation, the freedom of overflight and that of laying submarine cables and pipelines (Article 87). The formula line extending 60NM from the foot of the continental slope. However, the said geological parameters apply to the delimitation of the area beyond the 200NM, known as the Extended Continental Shelf, as up to the 200NM limit the continental shelf is another distant constraint maritime zone. The rights over the continental shelf are exclusive and pertain to the exploration and exploitation of natural resources of seabed and subsoil. Unlike EEZ, which has to be proclaimed by the coastal State, the sovereign rights of the coastal State over the continental shelf exist ipso facto and ab initio. In other words coastal State’s rights over CS “do not depend on occupation, effective or notional, or on any express proclamation and, therefore, can be exercised at any time” (Article 77). High Seas are all parts of the sea that are not included in any of the above maritime zones. Over High Seas, all freedoms are retained for every state. Mention should be made of “The Area” which comprises the sea-bed, ocean floor and subsoil below the high seas with the exception of that which is part of the state’s continental shelf (including the continental shelf which lies beyond 200NM from the baselines). The Area with its resources is common heritage of mankind and must be used for the benefit of all states. It is pointed out that some states, instead of taking full advantage of the rights (and the consequent responsibilities) of the contiguous zone, have chosen to declare “Archeological Zone” for the control of traffic of objects of an archaeological and historical nature found at sea. The removal of such objects from the seabed in that zone without approval result in an infringement within its territory or territorial sea of the laws and regulations referred to in article 33. Likewise, instead of declaring EEZ, states have chosen to declare “Fisheries Zone” for the regulation of fishing based on their exclusive sovereign right foreseen by UNCLOS for exploring and exploiting, conserving and managing the living resources up to the limit of 200NM from the baselines. It is noted that the above two zones are not described as separate maritime zones in UNCLOS. Coastal states may delimit their maritime zones unilaterally at the maximum allowable breadth, or, when one state’s zones overlap with the respective zones of a neighboring state, up to the median/equidistant line between the coastlines of the coastal states. The dominant method for the unilateral delineation of maritime zones to their maximum allowable breadth has been that of the conventional line constructed as the combination of the ‘envelope of arcs’ for the natural coastline and the ‘replica line’ (or tracé parallèle) for straight baselines. To implement the envelope of arcs from a point on the normal baseline, an arc is drawn at a distance equal to the breadth of the maritime zone (Boggs, 1930) and the, so called, envelope line is the locus of the intersections of the farthest arcs. On the other hand, the replica line is created with the transfer of the straight line segments seawards at a distance equal to the zone’s breadth. The outer limit of the maritime zone is formed by the combination of the two lines (Kastrisios, 2014). With respect to the bilateral delineation of maritime limits, the geographer must define the median line ‘every point of which is equidistant from the nearest points on the two baselines’ (UNCLOS, Article 15). More precisely, “median/ equidistant line is the method to be followed when the territorial seas of two coastal states overlap (UNCLOS, Article 12). The same principle was present in the 1958 Convention on the Territorial Sea and the Contiguous Zone with respect to the contiguous zone (TSC, 1958, Article 24) and in the 1958 Convention on the Continental Shelf with respect to the continental shelf (CSC, 1958, Article 12). However, the 1982 Convention remained silent with regards the CZ, whereas for the continental shelf and the exclusive economic zone (the latter was introduced into international law with the 1982 Convention) the principle of equity was adopted (UNCLOS, Article 74)” (Kastrisios and Tsoulos, 2016b). Towards achieving an equitable solution the median line serves as the reference for the final delimitation. In detail, “for the delimitation of maritime zones beyond the 12 mile zone, the states would first provisionally draw an equidistant/median line and then consider whether there are circumstances which must lead to an adjustment of that line’ (ICJ (Qatar v. Bahrain), 2001. Either unilaterally or bilaterally, outer limits may be constructed graphically on paper charts, semi-automatically with one of the existing GIS software (e.g. CARIS LOTS) or fully automatically with the most recent developments in the field (Kastrisios and Tsoulos, 2016a; Kastrisios and Tsoulos, 2016b). For the development of a MAS the association of legal attributes with maritime limits and boundaries’ information or marine parcels is necessary, in order to determine under whose authority or international treaty a particular limit or boundary is defined, and the restrictions around this specific marine parcel according to the legislation. From an administrative modeling viewpoint where the focus is on abstracting the real world as a principle, sea is not a legal entity until an interest is attached to it. Therefore, the very close relationship between each interest and its spatial dimension in the real world should be identified and registered in information systems. These elements form a unique entity, the marine legal object. Cadastres deal with entities consisting of interests in land that have three main components: spatial (spatial units), legal documents, and parties (Aien et al, 2013). The same applies in the marine environment. The state RRRs are defined through the international Treaties (and bilateral agreements for states with maritime neighbors) and transposed into national legislation with laws. When referring to sovereign rights, we mean the power of the state and/or the sovereign entity (as regards the marine space, the sovereign entity is always the coastal state) to act as they deem appropriate for the benefit of their citizens. The legal term of the aforementioned power is "exclusivity of jurisdiction" that is according to the international law the state has complete control of its affairs within its territory, without being accountable for the means of exercising this control. The extent or the kind of the sovereign rights differentiate according to the specific zone of the marine space we are referring to. The full sovereignty or the sovereign rights of the coastal state means that, apart from the coastal state, private entities (natural or legal persons) can exercise an activity or use part of the marine space only by means of transferring of a right from the State for a specific activity under contract or licensing. This kind of rights are recorded by a MAS. Public rights refer mainly to the constitutional right of every citizen of the state having an unlimited/ without obstacles access statewide (terrestrial and marine space). These rights are not secured for an individual interest but for a public interest. They may be described as protecting the public interest in the use and conservation of social resources. We refer to provisions that relate to the protection and conservation of water resources, places of preserved areas and cultural heritage. These places are pre-determined by law and the rights involved are of supreme importance and mandatory, in comparison to the following functional interests (Athanasiou et al, 2015). These RRRs include among others the protection of archaeological and historical objects found at sea, the protection of Marine Protected Areas and the general MSP restrictions. Progressively functional rights tend to acquire a private nature, associated with individual stakeholders that coexist with the state rights. In a wide sense, this term sets the limits of rights, which involve mainly the different ways of use, management and appropriation. In other words, in the marine environment the rights are limited in terms of space, duration and most importantly the extent, the content that refers only to the different kind of uses and management. The stakeholders are not owners but only beneficial “users”. (Athanasiou et al, 2015). When private property rights are used as a basis of interpretation, these rights do not represent full ownership let alone absolute property rights; they can be classified into usage and exploitation rights. Usage rights are associated only with space, and exploitation rights are associated with the resources as well. Usage rights may be granted by a legal person that has been delegated the authority to provide usage rights. Rights granted in this manner are subject to 94 Katerina Athanasiou, Efi Dimopoulou, Christos Kastrisios and Lysandros Tsoulos Management of Marine Rights, Restrictions and Responsibilities according to International Standards 5th International FIG 3D Cadastre Workshop 18-20 October 2016, Athens, Greece restrictions in terms of the nature of the usage rights (e.g. type and temporal aspects of use) and the spatial extent linked to the usage rights (sometimes defined by boundaries). Functional rights are granted either by leasing contracts or through licensing. It has to be noted that the authority of granting remains national and no freehold ownership is involved. These rights are associated with specific stakeholders. S-121 model maintains the class LA_RRR from LADM and the specializations of LA_Right, LA_Restriction, LA_Responsibility, through realization relationships. The class LA_Mortgage is not expressed in the model, since there is not applicable in the marine environment. The legislation which defines all RRRs of the marine space and is the basis upon which the content of the administrative resources is developed. The term "law" leads to the main division between substantial and typical law (i.e. the legislation produced by the legislative power of the House of Representatives). Thus, the substantial law includes the principles of Common Law and equity, the administrative acts of the Administrative Authorities (Ministerial and Presidential Acts) as well as acts of legislative content. Needless to say, the European Law (Treaties, Regulations, Directives, Decisions) and the International law are main legal binding sources. The legal sources which include the administrative regime of the RRRs are defined. The administrative sources are: the legal contracts that relate to the disposal of the functional rights of the State to private entities (as defined by the legal framework). The functional rights of the State granted are either by means of an administrative contract (administrative long leases or public works contracts) or the right is conferred by an administrative act, most usually by a license agreement. The administrative sources that need to be recorded in a MAS are different depending on each activity. For several resources the processes relating to registration of issue are standard. For example in Greece the registration associated with exploration for and extraction of gas and petroleum is highly refined. It is of high importance that all the activities that take place in the marine space need to be recorded accurately. This systematic recording could help to identify: the multiple licenses required for specific activities, regulated access rights, existing legal gaps. 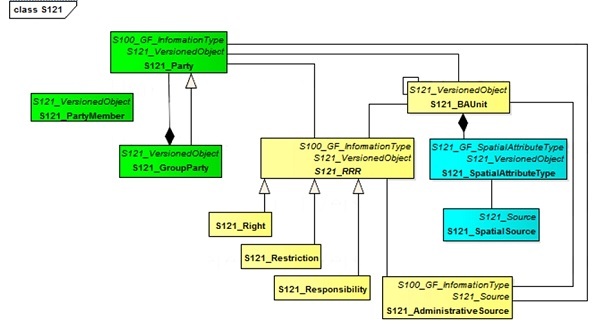 S-121 model keeps the class LA_AdministrativeSource in its structure. It is proposed the registration of administration sources and laws in different classes. The fact that all different rights find their base in some kind of transacting document is represented by the association between S121_RRR and S121_AdministrativeSource and this transacting document is recorded in the latter class. However in marine environment the existence of rights may be not emerged through the transaction, but from the law implementation. Another definition of marine parcel refers to: “A confined space having common specifications for its internal, mainly used as reference to locate a phenomenon. A marine parcel facilitates the distinction between contiguous territories and provides information concerning this phenomenon through appropriate codification” (Arvanitis, 2013). The third dimension: The inherent volumetric 3D nature of marine space is apparent. Marine RRRs, such as aquaculture, mining, fishing, and mooring and even navigation, can coexist in the same latitude and longitude but in different depths. The question is if the 3D representation is necessary for a MAS. So far, the geomatics’ community supports the idea of the 3D registration and visualization of marine interests. According to Ng’ang’a et al, 2004 “…Clearly, the right to explore for minerals may have an impact on the surface of the land, but it will also affect a 3D cross-section of the parcel below the land’s surface. 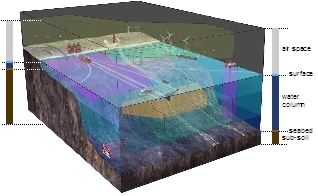 Policy-makers would no doubt benefit from an understanding of the upper and lower bounds of the exploration rights, and how these may affect the environment or other property entitlements within the same parcel.” Additionally, the registration of the restrictions that are defined by the laws and structure the marine legal object are related with the third dimension for most activities. They define in which vertical or horizontal distance is allowed to exercise other marine interests. Furthermore the multipurpose nature of the MAS demands access to additional types of information (geology, hydrology etc. ), except of the RRRs, in relation to marine spatial extents. The use of the third dimension is considered important. However the existing MAS have only used the third dimension for the representation of the seafloor. The fourth dimension: It is clear that time has always played an important role as the fourth dimension in cadastral systems. In marine environment most activities can coexist in time and space and can move over time and space. Therefore the registration of the fourth dimension will capture the temporary nature of many particular rights. Athanasiou (2014) incorporates the elements of the unique code to the spatial unit class in order to spatially define the MA_MarineParcel. The attributes are: The unclosZone, with possible values - territorial sea and EEZ, the physicalLayer, the seaType (in Greece for example, the sea is divided in 8 different pelages) and the port authority – the values of these attributes are from proposed code lists. 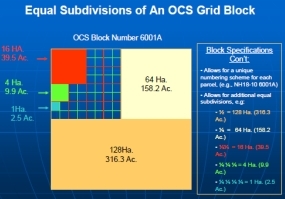 Furthermore the marineBlockCode is added, which is defined as “N°WGS84, E°WGS84/codeOfSubdividedGrid“ (Figure 2). The selection of the geodetic datum on which the coordinates will be dreferred, is one of the issues that should be taken into account in the development of a MC. A geodetic datum specifies the reference ellipsoid and the point of origin from which the coordinates are derived. Different states, even different mapping authorities of the same state, use different geodetic datums. Consequently, coordinates derived from one system do not agree with the coordinates from another datum, with their differences between adjacent states, as Beazley (1994) points out, amounting to several hundred meters. In addition to the horizontal datums, the utilization of different vertical datums has a significant impact as well. Hydrographic Services, which are assigned with the task to map the marine environment, as their priority is the safety of navigation they depict depth soundings from a mean low water level, such as the Lowest Astronomical Tide (LAT), or the more conservative Lowest Low Water (LLW)". On the other hand, the Land cadastral services usually use the Mean Sea Level (MSL). The difference between the two needs to be precisely calculated. One of the factors affecting the calculation is the distance of the permanent tide gauges from the location. The different sea levels and the precise calculation of the sea level have also a significant impact to the development of a MC. In detail, the delineation of the coastline may vary greatly depending on the vertical datum, which consequently has a significant impact to the outer limits of the maritime zones over which the states exercise their rights. For instance, as Leahy (2001) describes, for a foreshore of 0.5% gradient, a difference of 0.5m in sea water level results 100m error in the location of the coastline, a value that may exceed 200m in some cases. In extreme cases and depending on the techniques followed for the delineation of the coastline, Leahy calculated that the horizontal displacement of the coastline may reach 3NM when (the coastline) has been derived from topographic maps of scales 1:100.000. And here comes another issue; where does the data come from? Is it data acquired in situ using techniques according to specifications, or data derived from paper charts/maps compiled years ago with obsolete and error prone techniques? Another issue with the different sea levels is the potential reclassification of a sub-surface feature to a low-tide elevation, which may expand the maritime zones of the coastal state [Article 13(1)]. We pointed out the importance of the precise delineation of the baselines as they are the reference where from the maritime zones are measured. However, it is not the only issue that affects the precise division of marine space. As nicely put by Carrera (1999), “marine boundaries are delimited, not demarcated, and generally there is no physical evidence, only mathematical evidence left behind”, hence the reference surface used for the delimitation of the outer limits and boundaries is another source of error. While technical publications, e.g. TALOS, state their preference towards the ellipsoidal earth, something of the kind is not stated in UNCLOS. The maximum relative error with approximating the earth as a sphere is 0.5%, but if projected plane was to be used for creating buffers of the baselines (e.g. Mercator projection) the produced error would be significantly greater. Unfortunately, UNCLOS remains silent in many of its provisions regarding the technical aspects of the delimitation, including the horizontal and vertical datums, which the states need to consider and agree with neighboring states towards an effective MC. Recent research focuses on regulating the establishment of basic principles, semantics, rules and procedures relating to the creation of a MAS. So far, standardization is a requirement to support the development of a National Land Information System. The same applies to the marine environment, since the term land encompasses the water element, as ISO 19152 states. S-100 gives the appropriate tools and framework to develop and maintain hydrography related data, products and registers. The extension of this standard to support the LADM, in order to include the registration of additional types of marine data, specified by the law is addressed through the development of S-121. S-121 may serve as the bridge between the land and marine domains while the Maritime Limits and Boundaries following the S-121 standard may be used in the marine administration domain. Part of the S-121 project development would be the specialization of the generic code lists of the various attributes to marine environment for every State. Furthermore given that IHO S-121 is based on LADM, it is inferred that INSPIRE can cooperate as well with S-121 mainly in the spatial dimension. To this purpose, the connection and the utilization of the terrestrial mapping methods and standardization techniques must be examined. Additionally, this paper refers to several issues that are related to the definition of the marine legal object and need to be considered in the development of a MAS. Organize national legislation, taking into account EU orientations and directives. Government should enact appropriate legislation and maintain a database referenced to a common spatial system that is supported by appropriate standards. Furthermore, laws and regulations that promote conflict in marine space need to be identified with the resolution of spatial definitions within legislation. The use of a unique code of identification for each marine parcel is considered necessary for the establishment of a single management system. The selection of the geodetic datum on which the coordinates will be referred, is one of the major issues that should be taken into account in the development of a MC, as well as the level of accuracy in the delimitation of the marine legal objects. Regarding the Greek case, a conclusive approach becomes progressively a matter of priority, which could support the State and the European MSP initiatives. The delimitation of maritime boundaries with its neighbors needs to be agreed upon, in order to define the area where the MAS applies. In addition, the creation of a national ocean’s policy would be the first step towards the development of a MAS managing the complex regime of legislation and overlapping jurisdictions. Aien, A., Kalantari, M., Rajabifard, A., Williamson, I. and Bennett, R. (2013). Utilizing Data Modeling to Understand the Structure of 3D Cadastres. Journal of Spatial Science. Issue 58 (2): pp. 215-234. Arvanitis, A. (2013). Development of an Integrated Geographical Information System for the Marine Space, Hellenic Cadastre, Athens. Arvanitis, A., Giannakopoulou, S. and Parri, I. (2016). Marine Cadastre to Support Marine Spatial Planning. In the Common Vision Conference 2016 Migration to a Smart World, EULIS, Amsterdam, the Netherlands. Athanasiou, A. (2014). Marine Administration Model for Greece, based on LADM. Bachelor Thesis, Department of Spatial Planning and Regional Development, School of Rural and Surveying Engineering, National and Technical University of Athens, Athens, Greece. Athanasiou, A. Pispidikis I. and Dimopoulou, E. (2015). 3D Marine Admininstration System, Based On LADM. In 3D Geoinfo Conference, Kuala Lumpur, Malaysia. Barry, M., Elema, I. and van der Molen, P. (2003). “Ocean Governance in the Netherlands North Sea. New Professional Tasks”, Marine Cadastres and Coastal Management, FIG Working Week 2003, Paris. France. Beazley, P.B., (1994). Technical Aspects of Maritime Boundary Delimitation, Volume 1 No. 2, International Research Unit, Durham University, UK. Boemre (2011). “Development of Marine Boundaries and Offshore Leases”, Management of Marine Resources. http://www.mcatoolkit.org/pdf/ISLMC_11/Marine_Boundaries_Offshore_Lease_Areas_ Management.pdf. Boggs, S.W. (1930). Delimitation of the territorial sea: the method of delimitation proposed by the delegation of the United States at the Hague Conference for the Codification of International Law. American Journal of International Law 24 (3), 5pp. 41-545. Canadian Hydrographic Service & Geoscience Australia, (2016). Supporting the ISO 19152 Land Administration Domain Model in a Marine Environment, Paper for Consideration by HSSC & S-100 WG – Revised 26 February 2016. Carrera, G. (1999). Lecture notes on Maritime Boundary Delimitation, University of Durham, UK, July 12-15, 1999. Cockburn, S. and Nichols, S. (2002). “Effects of the Law on the Marine Cadastre: Title, Administration, Jurisdiction, and Canada’s Outer Limit”, In Proceedings of the XXII FIG International Congress, 2002. Cockburn, S., Nichols, S. and Monahan, D. (2003). UNCLOS’ Potential Influence on a Marine Cadastre: Depth, Breadth, and Sovereign Rights. In Proceedings of the Advisory Board on the Law of the Sea to the International Hydrographic Organization (ABLOS) Conference "Addressing Difficult Issues in UNCLOS". Presented at the International Hydrographic Bureau, Monaco, October 2003. CSC (1958). Convention on the Continental Shelf (Geneva, 29 April 1958) 499 U.N.T.S. 311; 15 U.S.T. 417; T.I.A.S. No. 5578 entered into force 10 June 1964. De Latte, G. (2015). MARINE CADASTRE General rights and charges under the United Nations Convention on the Law of the Sea (UNCLOS) - Patrimonial rights in the different marine zones - Registration of patrimonial rights. 11 August 2015. de Latte, G. (2016). Marine Cadastre – Legal Framework UNCLOS & EU legislation. In the Common Vision Conference 2016 Migration to a Smart World, EULIS, Amsterdam, the Netherlands. Duncan, E.E. and Rahman, A. (2013). A Multipurpose Cadastral Framework For Developing Countries-Concepts. Electronic Journal on Information Systems in Developing Countries. Issue 58 (4): pp. 1-16. Griffith-Charles, C. and Sutherland, M.D. (2014). Governance in 3D, LADM Compliant Marine Cadastres. In 4th International Workshop on 3D Cadastres, Dubai, United Arab Emirates. ICJ (International Court of Justice), Maritime Delimitation and Territorial Questions between Qatar and Bahrain (Qatar v Bahrain), Merits, Judgment, 16 March 2001, ICJ Reports 2001, p. 40, para.212. IHO (2015). Universal Hydrographic Data Model. Publication S-100, ed. 2.0.0, June 2015, IHO, Monaco. ISO 19152 (2012). ISO 19152:2012, Geographic Information – Land Administration Domain Model. Edition 1, Geneva, Switzerland. Kalantari, M., Rajabifard A., Wallace J. and Williamson I. (2008).Spatially referenced legal property objects. Journal of Land Use Policy. Issue 25 (2): pp. 173-181. Kariotis, C.T. (1997). Greece and the Law of the Sea, Published by Kluwer Law International, the Netherlands, 1997. Kastrisios, C., (2014). Graphical Methods of Maritime Outer Limits Delimitation, Nausivios Chora, Piraeus, 5/2014. (Available at http://nausivios.snd.edu.gr/docs/2014E1.pdf). Kastrisios, C. and Tsoulos, L. (2016a). An Integrated GIS Methodology for the Determination and Delineation of Juridical Bays, Ocean & Coastal Management, Volume 122, Pages 30–36. Kastrisios, C. and Tsoulos, L. (2016b). A Cohesive Methodology for the Delimitation of Maritime Zones and Boundaries, Ocean & Coastal Management, Volume 130, Pages 188– 195. doi:10.1016/j.ocecoaman.2016.06.015. Leahy, F.J., Murphy, B.A., Collier, P.A. and Mitchell, D.J. (2001). ‘Uncertainty Issues in the Geodetic Delimitation of maritime Boundaries’, Proceedings of the International Conference on Accuracies and Uncertainties Issues in Maritime Boundaries and Outer Limits, International Hydrographic Bureau, Monaco. Lemmen C.H.J (2012). “A Domain Model for Land Administration”, PhD Thesis, Technical University of Delft, 2012. Longhorn, R. (2012). Assessing the Impact of INSPIRE on Related EU Marine Directives, In Hydro12 Conference, Rotterdam, 13 November 2012. McGregor, M., (2013).., S-10X Maritime Boundary Product Specification – Explanatory Notes. Paper presented at the 26th IHO Transfer Standard Maintenance and Application Development Working Group (TSMAD) and 5th Digital Information Portrayal Working Group (DIPWG), Silver Spring, Maryland, USA, 10-14 June, 2013. Millard, K. (2007). Inspire ‘Marine’ – Bringing Land and Sea Together. HR Wallingford 2007. Ng'ang'a, S. (2006). “Extending Land Management Approaches to Coastal and Oceans Management: A Framework for Evaluating the Role of Tenure Information in Canadian Marine Protected Areas”, Department of Geodesy and Geomatics Engineering, University of New Brunswick, 2006. Ng'ang'a, S.M., Sutherland, M., Cockburn, S. and Nichols, S. (2004). Toward a 3D marine Cadastre in support of good ocean governance: A review of the technical framework requirements. Computers, Environment and Urban Systems Journal. Issue 28: pp. 443-470. Nichols, S. (1992). “Land Registration in an Information Management Environment”. PhD Dissertation, Department of Surveying Engineering, University of New Brunswick, Fredericton, NB, 340 pages. Nichols, S., Ng’ang’a, S.M., Sutherland, M.D. and Cockburn, S. (2006). Marine Cadastre Concept. Chapter 10 in Canada's Offshore: Jurisdiction, Rights and Management. 3rd edition, Trafford Publishing, Victoria, Canada. NOAA (2014). An Ocean of Information, http://marinecadastre.gov. Prescott, J.R.V. and Schofield C.H. (2005). The maritime political boundaries of the world. Leiden: M. Nijhoff. Rahman, A., van Oosterom, P., Hua, T.H., Sharkawi, K.H. and Duncan, E.E. (2012). 3D Modelling for Multipurpose Cadastre. In 3rd International Workshop on 3D Cadastres: Developments and Practices, Shenzhen, China. Rajabifard, A., Binns, A. and Williamson, I. (2005). “Administering the Marine Environment. The Spatial Dimension”, Journal of Spatial Science, 50(2): 69-78. Rajabifard, A., Williamson, I. and Binns, A. (2006). “Marine Administration Research activities within Asia and Pacific Region – Towards a seamless land-sea interface”, FIG, Administering Marine Spaces: International Issues, Publication No. 36, pp. 21 -36. Strain, L., Rajabifard, A. and Williamson, I.P. (2006). “Spatial Data Infrastructure and Marine Administration”, Marine Policy, 30: 431-441. TSC (1958). Convention on the Territorial Sea and the Contiguous Zone (Geneva, 29 April 1958) 516 U.N.T.S. 205, 15 U.S.T. 1606, T.I.A.S. No. 5639, entered into force 10 Sept. 1964. United Nations (1982). United Nations Convention on the Law of the Sea, New York: United Nations, 1982. Widodo, M.S, (2003). The Needs for Marine Cadastre and Supports of Spatial Data Infrastructures in Marine Environment – A Case Study, FIG Working Week, Paris, France, April 13-17, 2003. Widodo, M.S, (2004). Relationship of Marine Cadastre and Marine Spatial Planning in Indonesia, 3rd FIG Regional Conference Jakarta, Indonesia, October 3-7, 2004. Widodo, S., Leach, J., and Williamson, I.P. (2002). Marine Cadastre and Spatial Data Infrastructures in Marine Environment, Joint AURISA and Institution of Surveyors Conference, Adelaide 25-30 November. Katerina Athanasiou is currently a Master Student of Geoinformatics at School of Rural and Surveying Engineering, National Technical University of Athens. She graduated from the same institution in 2014. Her bachelor thesis referred to the development of a Marine Administration Model for Greece, based on International Standards. Efi Dimopoulou is Associate Professor at the School of Rural and Surveying Engineering, NTUA, in the fields of Cadastre, Spatial Information Management, Land Policy, 3D Cadastres and Cadastral Modelling. She is the Programme Director of the NTUA Inter- Departmental Postgraduate Course «Environment and Development» and President of the Hellenic Society for Geographical Information Systems (HellasGIs). Christos Kastrisios is Lieutenant Commander of the Hellenic Navy and PhD candidate in Cartography at the National Technical University of Athens (NTUA). After his graduation from the Hellenic Naval Academy (HNA) in 2001 he served on board frigate and submarines of the Hellenic Navy Fleet, until 2008 when he was appointed to the Hellenic Navy Hydrographic Service (HNHS). His assignment at the HNHS includes various posts including that of the deputy director of Hydrography Division and his current position as the Head of the Geospatial Policy and Foreign Affairs Office. He is the national technical expert on the Law of the Sea, representative and member in NATO and IHO working groups and member of national and international geospatial societies. He holds a Master’s degree in GIS from the University of Maryland at College Park. He is part-time lecturer at the HNA and NTUA. Lysandros Tsoulos is professor of Cartography at the School of Surveying Engineering - National Technical University of Athens [NTUA]. In 1975 he joined the Hellenic Navy Hydrographic Service [HNHS] where he worked for 17 years (Directorate of Cartography and the HNHS Computing Center). In 1992 he was elected member of the faculty at the School of Surveying Engineering - NTUA. He is the director of the NTUA Geomatics Center and the Cartography Laboratory. His research interests include cartographic design, composition and generalization, GIS, digital atlases, spatial data and map quality issues, spatial data standards and the law of the sea. Currently he is president of the Hellenic Cartographic Society and member of national and international scientific committees.